Anushka Sharma and Varun Dhawan starrer 'Sui Dhaaga' has everyone gripped. The trailer is out and the audience seemed to be really emotionally roused by it. Inspired by the government's 'Make In India' campaign, the movie revolves around a lower-middle-class couple, who are struggling to keep their art of embroidery still relevant. 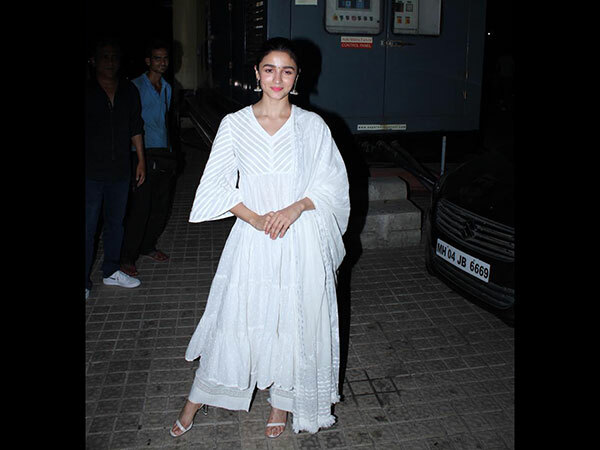 Going by the trailer, 'Sui Dhaaga' also seems like a very important movie for the fashion enthusiasts, who are concerned about the grassroots of fashion. In order to bring alive their characters in the movie, Anushka and Varun went for a de-glam look but at the trailer launch, these two opted for a slightly glamorous look. They looked simple but they certainly had vibrant addition to their outfits. The actors looked fabulous at the event and gave us mid-week attire goals. So Anushka wore a plain-hued dark blue-coloured sweatshirt, which was half-sleeved and she paired it with shiny jacquard pants that gave her look a glam touch. Her pants were highlighted by intricately done damask prints and with that, she had us crushing all over her. She completed her look with black pencil heels. As for Varun, he went for a sporty look with an athleisure ensemble. He paired his plain black tee with complementing track pants and white-hued sports shoes but it was the jacket that made all the difference. The 'October' actor wore a silver and red graphic jacket that was eye-catching and as shiny as Anushka's pants. Their style quotient was high but at the same time, they looked believable. We wish to see their more fashionable side in the upcoming promotions.